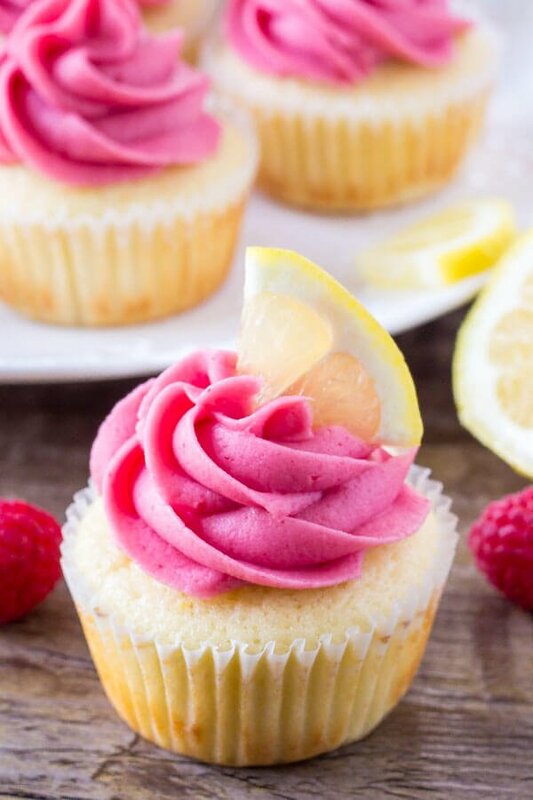 These lemon raspberry cupcakes are fluffy, moist, and bursting with fresh flavors. 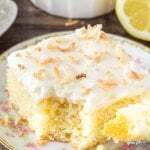 They start with lemon cupcakes that have a soft texture and hint of lemon. Sweet juicy berries in the raspberry frosting make these a showstopper. 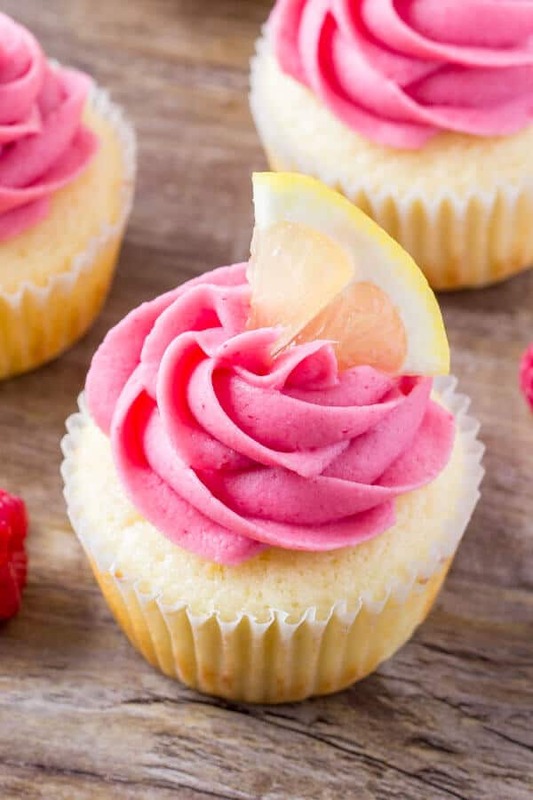 Lemon and raspberry make for such a delicious combo – which is exactly why you’re going to love these lemon raspberry cupcakes. 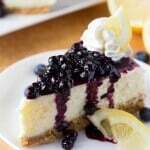 The sweet, juicy berries really compliment the bright, tanginess of the lemon. And together they make for a combo that’s never too sour. Last year I made strawberry lemonade cupcakes and shared the recipe over on Lil Luna – so this spring I wanted to make a bit of a remix of the recipe to share with you here on Just So Tasty. These cupcakes are made entirely from scratch. 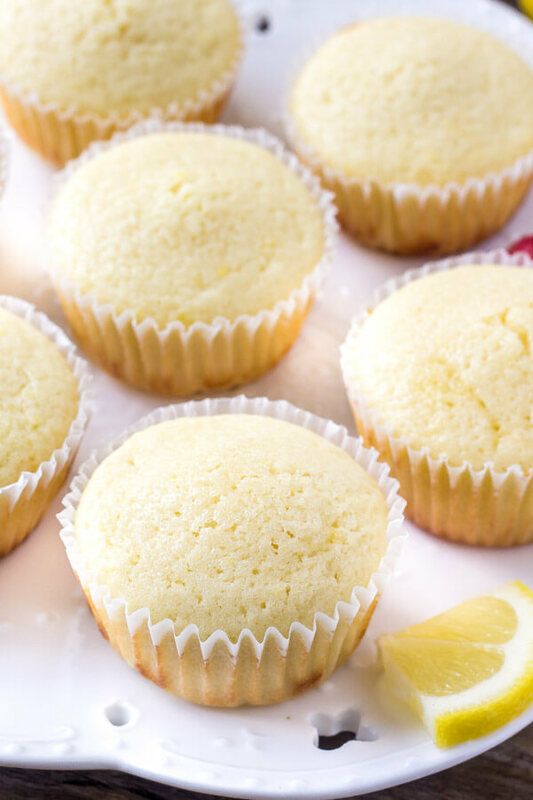 For the lemon cupcakes, there’s a quintessential ingredients that give them that deliciously soft texture and lemon flavor that’s never sour. Start with real butter. Butter gives TONS of flavor and ensures that the cupcakes never taste oily. Lemon zest and freshly squeezed lemon juice for a fresh, sunny day, slightly tangy lemon flavor that isn’t sour. Milk and sour cream for moisture. I found this combo makes the lemon cupcakes extra moist thanks to the sour cream, but not too dense thanks to the milk. I definitely recommend having all the ingredients at room temperature so that everything can mix together evenly without over mixing the batter. Over mixing = tough cupcakes. Then the raspberry frosting is ALL kinds of delicious. Fluffy, creamy, and filled with real raspberry flavor. No artificial stuff here. Just pure bright red berries. (Fresh or frozen is totally ok). First puree the raspberries in a blender or food processor. Then push the mixture through a strainer to remove the seeds. Boil up the berries in a saucepan until the mixture is about 1/4 of the original volume and thick like jam. Then place it in the fridge or freezer to cool completely. This step is soooooo important, or else your frosting can get too watery or separate. Beat the butter until fluffy, and mix in about 1/2 of the powdered sugar and salt. Then beat in 2-3 tablespoons of the cold reduced raspberry sauce, followed by the rest of the powdered sugar. If needed, beat in a little heavy cream. And voila! 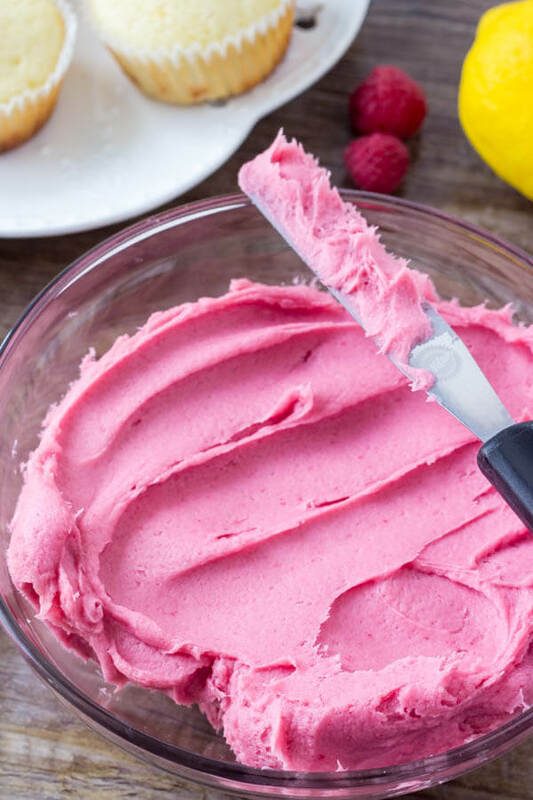 Creamy, fluffy, bright pink raspberry frosting made with real berries for your lemon raspberry cupcakes. Then it’s time to frost away. I (obviously) like a pretty generous helping of frosting per cookie – so I frosted mine using a 1M star tip and piping bag. 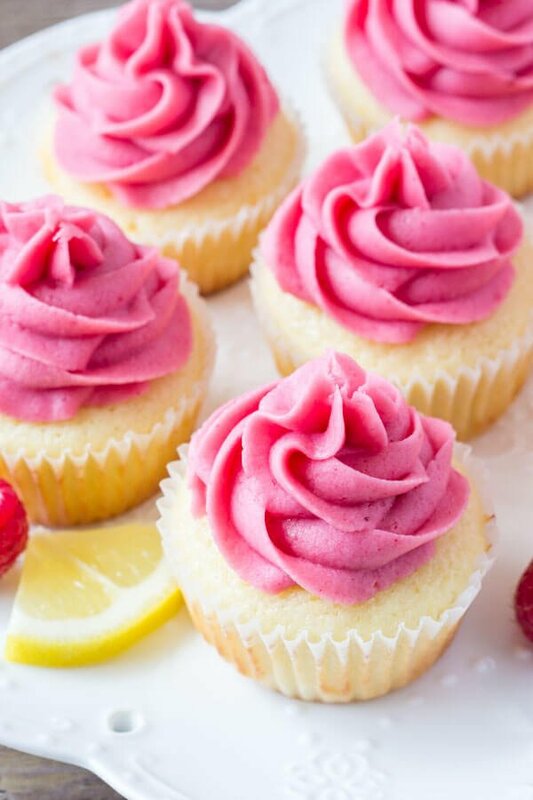 These lemon cupcakes with raspberry frosting have so much flavor in every bite and are seriously beautiful. Preheat the oven to 350F degrees and line a muffin tin with muffin papers. Beat together the butter, sugar, and lemon zest in a large bowl until fluffy. In a liquid measuring cup or small bowl gently whisk together the milk and sour cream with a fork. Beat about 1/2 of the flour mixture into the butter mixture, followed by about 1/2 of the milk and sour cream. Repeat with the rest of the flour & sour cream mixture. Turn off the mixer and gently fold in the lemon juice. Spoon the batter into the prepared muffin pan filling each about 2/3 to 3/4 full. Bake in the preheated oven for 16-18 minutes or until an inserted toothpick comes out clean. Push the puree through a sieve to remove the seeds. (I use a rubber spatula for this). Add the puree without seeds to a medium saucepan over low-medium heat and bring to a boil while stirring. Boil for 10-15 minutes or until the mixture is about 1/4 to 1/3 of the original volume and thick like jam. Remove from the heat and place in the freezer or fridge to cool fully. In a large bowl beat the butter until fluffy then mix in 2 cups powdered sugar. Mix in 2-3 tablespoons of the cold raspberry sauce. (It must be cold, otherwise the frosting can separate). Mix in the rest of the powdered sugar about 1/2 cup at a time, adding in the cream if it seems too thick. Frost the cupcakes with a piping bag and tip (I used a 1M tip) or a knife. * You'll need 2 medium-large sized lemons total. **Store cupcakes in an airtight container at room temperature for up to 3 days. ***Unfrosted cupcakes can be frozen and thawed in the fridge overnight. Hello! 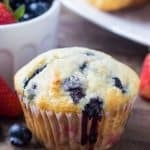 I’ve made these and your strawberry lemon cupcakes a few times, but I was wondering if it was possible to turn them into a cake instead of cupcakes? 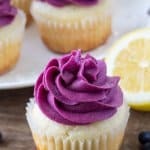 I’ve never turned a cupcake recipe into a cake one, so I was wondering if you had any tips or suggestions to do so? Thanks! 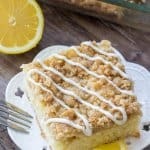 This recipe is absolutely AMAZING!!! Love it! I doubled the recipe for cupcakes and frosting. It made 30 cupcakes. This is one recipe I’m keeping. I love that there’s no artificial flavoring or coloring!